riker:volchok Construction, Landscapes & Design provides professional sod services to Kitchener, Waterloo, Cambridge and Surrounding Area. A lush, green, professionally laid lawn can dramatically improve the look of your home or business. We are experienced and have sodded hundreds of lawns. Our process includes completely removing the existing lawn area, finely grade and leveling your area with new topsoil and then installing freshly cut sod. No job is too big or small and we guarantee your satisfaction. Once new sod is installed the maintenance is a generally easy processes that allows you to grow a lush green lawn that you can enjoy for years to come. Below are some ways to ensure adequate care for your new sod. It is important to water your sod as soon as you lay it, within the first hour is ideal. Watering frequently keeps the delicate roots from drying out, especially if your sod is exposed to full sunlight, and it prevents the sod from shrinking in size. Make sure you water uniformly so it reaches all the way down and becomes soggy. Keep soaking the sod with water for at least the first week every day and ideally for two weeks for 30-45 minutes each time. Once the sod is well rooted (after a month has lapsed), you can cut back the heavy watering schedule to once every two weeks for a 20-30 minutes to ensure a slightly moist soil. However, on unusually hot days, you can water twice a day, once in the morning and then at night (for 15 minutes each). If temperatures rise, you can put sprinklers on every two hours to make sure water penetrates the soil through each panel of sod, especially the edges and the seam. In the summer months, it is always best to water either at night or early morning (when chances of evaporation are minimum). If your sod starts paling in color, it means it is not receiving enough water. Continue watering it thoroughly so it doesn't die. If it does start turning yellow due to inadequate water the sod can often be saved as long as it watered substantially. If you have any children or pets, you need to cordon off the area where you have laid sod. Pressure on your newly laid sod can cause the delicate root system to tear even before it is fully formed (delaying the knitting process with the soil and at the seams). Wait until the sod gets fairly long (4"-5") before mowing your sod to ensure the roots have established themselves into the soil and the sod can begin to seed. Remember not to mow more than 1/3 of the leaf length the first time, taking it down from there with each successive mowing (until you reach the height you wish to maintain). You should fertilize your sod with a high phosphorous fertilizer to help give it a healthy start. Fertilize once again two weeks after installation, and water it immediately to prevent the sod from getting burnt. Avoid fertilizers with high nitrogen content since these can lead to disease. Remember to fertilize your sod every 50 to 60 days from March to October, resuming this pattern again next spring. Fertilizing in the winter can stress your sod. Use a weed control fertilizer to tackle weeds, if any. 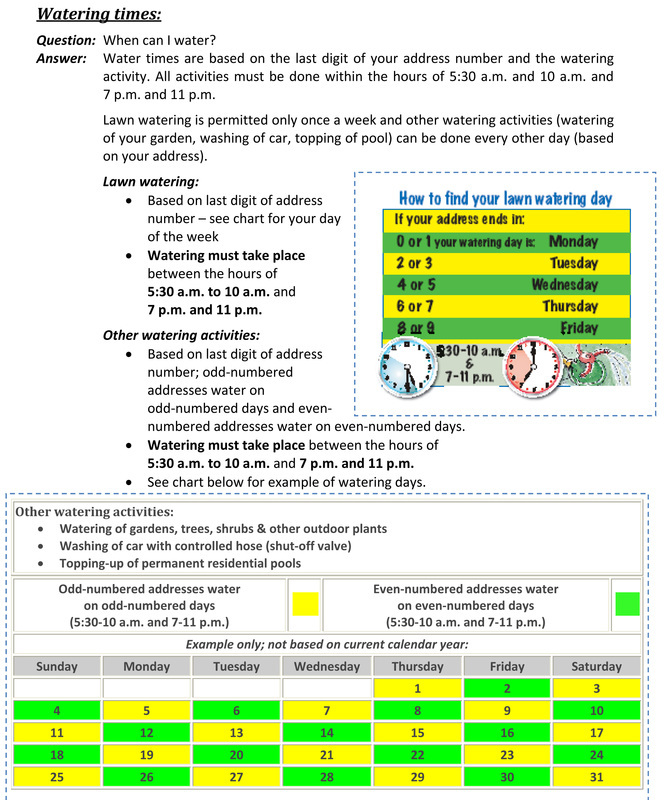 Below are the Region of Waterloo's Watering Schedule for when you are able to water your lawn in Kitchener, Waterloo, Cambridge and surrounding area. If you have your lawn sodded you will need to water your lawn every day for the first week so you will need to contact the Region to extend your watering times. Information on extending your watering times can be found below as well.